MotorCities 2018 Award of Excellence Winners: Dan Stahl (second from left), accepting the award for Heritage Tourism for his parents Mary and Ted Stahl of the Stahls Automotive Foundation of Chesterfield Twp. ; Steve Shotwell (center) accepting the award for Education on behalf of the Piquette T’s and Casual T’s of Detroit; Kevin Kirbitz (second from right), Operations Manager, accepting the award for Preservation on behalf of General Motors Durant-Dort Factory One in Flint; flanked by Brian Yopp, MotorCities Director of Programs & Operations (left) and MotorCities Executive Director Shawn Pomaville-Size (left). 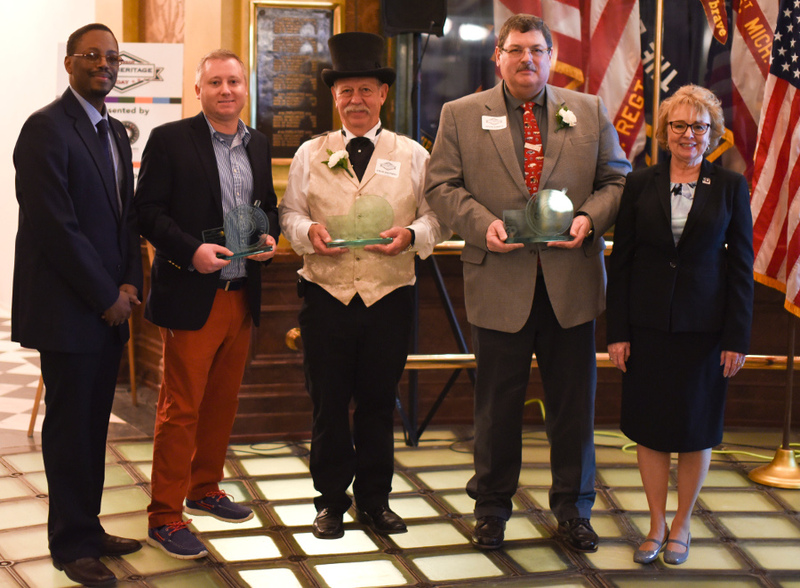 On December 6, the MotorCities National Heritage Area Partnership, in partnership with the Michigan Legislative Auto Caucus, honored two individuals and three organizations who distinguished themselves in the areas of auto and labor heritage with its 5th annual 2018 Awards of Excellence. The winners were announced Thursday during Michigan Auto Heritage Day, an invitation-only event at the Capitol Rotunda in Lansing. 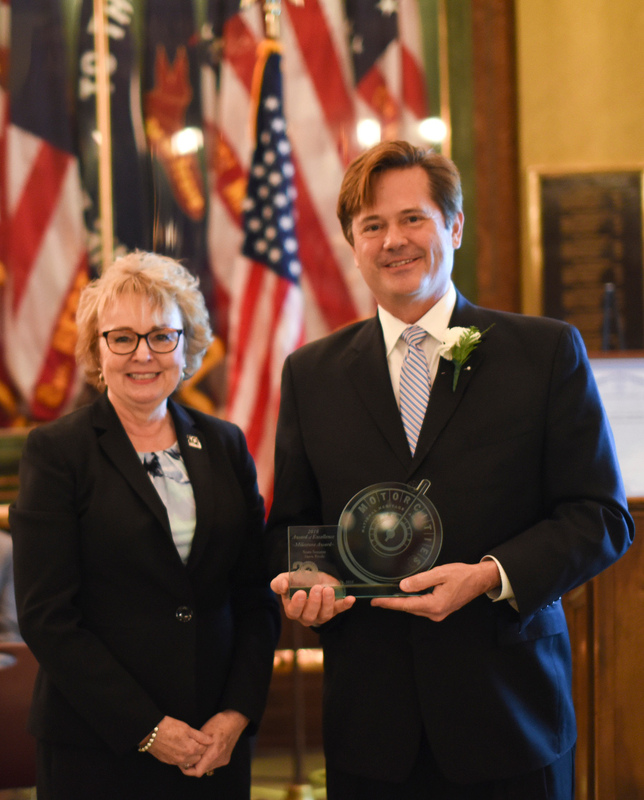 State Senator Steve Bieda (D-Warren) was honored with MotorCities’ annual Milestone Award. He has served as both a Senator and Representative of his local district in the Michigan state legislature since 2002. 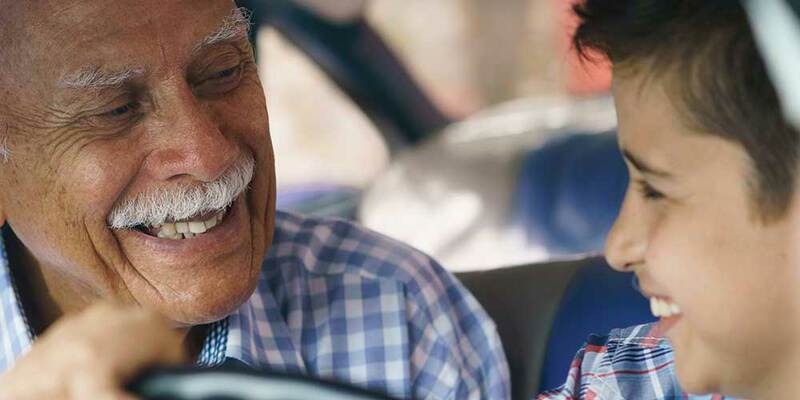 He helped found and co-chairs the Michigan Legislative Auto Caucus, providing a forum for legislative discussion about all matters related to the auto industry in the state. It was in partnership with that caucus that MotorCities launched the Michigan Auto Heritage Day and Awards of Excellence in 2014. 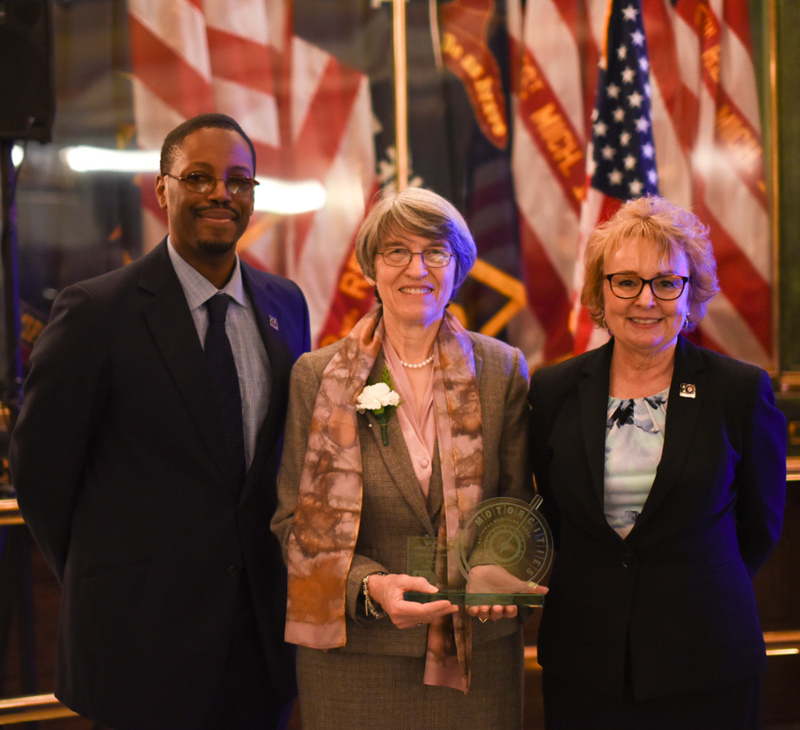 Sandra Clark, director of the Michigan History Center, received the MotorCities Champion Award. When MotorCities was being created, there was a lot of talk about Detroit as the "Motor City," however, it was Clark who said that the story is so much bigger. In her role at the Michigan History Center, Clark added the true statewide perspective. Her leadership was critical in receiving the state's endorsement in order to move up to consideration for the heritage area. Clark went on to serve as chair of the MotorCities Board of Directors and continues to advocate for the state's auto history. In addition, the winner of the Award of Excellence for Preservation was General Motors Durant-Dort Factory One in Flint, the factory operated by Billy Durant and J. Dallas Dort prior to Durant’s acquisition of Buick in 1904 and the formation of General Motors in 1908. Kevin Kirbitz, Operations Manager for GM Factory One, accepted the award. The Award of Excellence for Heritage Tourism went to Mary and Ted Stahl of the Stahls Automotive Foundation of Chesterfield Township, which stands to foster education and appreciation of vehicles of all makes and model at their museum through hands-on interaction. Dan Stahl, son of Mary and Ted, accepted the award. Finally, the Award of Excellence for Education winner was the Model T Outreach Program operated by the Casual T’s and Piquette T’s of Detroit, who provided a 45-minute presentation to third graders across the region, but also brought those students outside the classroom to interact with a Model T and driver. Steve Shotwell accepted the award on behalf of the two groups. The Michigan Auto Heritage Day event was sponsored by the Detroit Metro Convention and Visitors Bureau and the UAW-GM. For more photos from the day, click here. MotorCities Director of Programs & Operations Brian Yopp (left); Sandra Clark (center), director of Michigan History Center, with her Champion Award; and Shawn Pomaville-Size (right).